Maihana Soumakyou: Uniting Barrage Action (舞華蒼魔鏡　Uniting Barrage Action, lit. "Flower Dance of Magic Blue Mirror") is a Horizontal Danmaku Shooting Game, developed and published by souvenir circ. Originally released for PC on August 11, 2012, at Comiket 82. An enhanced version was released for PlayStation 4, as part of Play, Doujin!, on January 25, 2018 in Japan published by Unties. 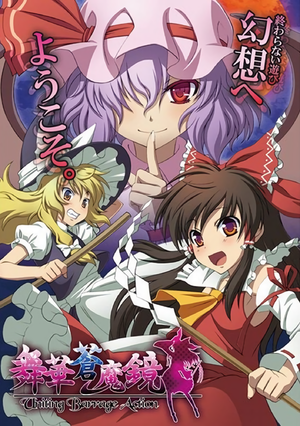 The PlayStation 4 version was later localized under the title of Touhou Azure Reflections and was released on May 15, 2018 for both North America and Europe, with a 30% discount on the first two weeks after the game's launch. The Nintendo Switch version was later announced with a worldwide release date of August 30, 2018. As the Scarlet Mist incident mysteriously returned, Reimu and Marisa went on their own ways to try and resolve the incident. Similar to various fangames, all of the characters are voiced with official seiyuus, with others reprising their previous voice roles, like Rina Sato, who voiced Reimu in fangames like Koumajou Densetsu II: Stranger's Requiem. This page was last edited on 8 October 2018, at 08:46.